Prior to the formal establishment of the Graduate School, courses of postgraduate status were offered under the control of a faculty committee on graduate studies. In 1910, the formal organization of graduate studies into a Graduate School was authorized. Dr. Willis H. Bocock served as the Graduate School’s first dean and was succeeded by R. P. Stephens, George H. Boyd, Gerald B. Huff, Thomas H. Whitehead, Hardy M. Edwards, Jr., John C. Dowling, Gordhan L. Patel, Maureen Grasso, and present dean Suzanne Barbour. The Graduate School coordinates the graduate programs of all schools and colleges of the University. Matters of policy and procedure are determined by the graduate faculty through the graduate council. The graduate faculty consists of faculty members appointed by the President on the basis of productive research, effective teaching, and other creative activities. The policies adopted by the graduate council are administered by the dean of the Graduate School. 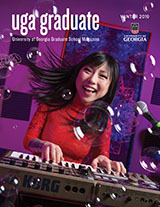 The Graduate School administers all graduate programs of the University. It offers the Master of Arts in 34 disciplines, the Master of Science in 47 disciplines and the Doctor of Philosophy in 80 disciplines. Professional master’s degrees are available in 28 areas, and professional doctoral degrees are offered in education and music. The University also awards the Master of Education in 21 areas, the Specialist in Education in 19 areas and the Doctor of Education in 14 areas.